16 years. That's how long I've lived in Bend and I've never stepped foot inside of Roszak's Fish House. The self proclaimed king of seafood has been open for 37 years and is best known, oddly enough, for its prime rib special. Curious as to how a restaurant could survive for so long in the landlocked high desert, I used to think it was a front for backroom cockfighting rings or black market loan sharks. You know, the stuff of '80s movies. But as I started looking into it, I realized it wasn't hiding anything—it's a local hang out and a staple for many old school Bendites; a place where everyone knows your name and the waitress is waiting for you with a smile and your favorite drink. It's a Cheers but with fish and prime rib. Still skeptical though, I refused to go at it alone, so I dragged along Source staff reporter Magdalena Bokowa. She was overly enthusiastic, gleefully exclaiming: "This could be my Midtown local. The place where I grow old in." Aside from the eagerness to become an alcoholic, she was nervous. Would it be a scene from an old Western when we walked in? A crowd falling silent and judging the newcomers, perhaps? She met me outside the big wooden door, simply marked "dining." Her eyes shifted nervously, saying "Is this it?" 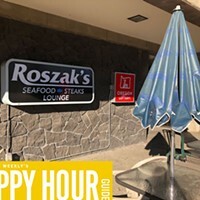 Roszak's barely has an online presence, and their Yelp reviews could charitably be called "brutal." The majority of online opinion is fairly negative. "It's the type of place whose clientele has been slowly dying off due to either old age or side effects of alcoholism," reads one review. So with this in mind, we discussed strategies to alleviate food poisoning. We bought Pepto Bismol. Magdalena tapped her purse, saying "I have Immodium, just in case." She gave me an all-too-knowing glance that would haunt me for the rest of the lunch. We took a breath, entered and prepared for an onslaught of musty smoke and dingy carpets. We were disappointed. Instead, a bright and airy, albeit dated décor, greeted us, as did a smiling career waitress, who cheerfully exclaimed, "Welcome, friends!" We beelined for the lounge and walked into what is a cross between the greatest bar that ever existed in 1984 and a dim and cozy fever dream ready to lull you back to sleep. It was a weekday and noon, but the place was going off. The two cornerstone drunks were obediently seated at the bar discussing the inauguration while a group of construction workers told jokes and waited for their drinks. Low-key and comfortable, we slipped right in, as if we were already regulars. "Let the seafood feasting begin," I declared. As if by magic, an enormous plate of razor clams appeared. Well, technically, first it was a screwdriver and Bloody Mary followed by a few Long Islands, but who's counting?! From there came a tremendous pile of clams floating gently in a white wine sauce amid a bed of full garlic cloves. Mouth. Watering.After being disappointed that no, there would be no exceptions to the 4 pm arrival of the prime rib special, my partner in crime somewhat begrudgingly decided to settle for the shrimp medley platter, solely because, as she put it, "It has the words medley and platter in it." I doubled down on fish and chips. As we waited, the soft sounds of Donald Trump's inauguration played in the background and images of rioting and tear gas rolled in. I'm not sure if it was this surreal scene or the lounge, or the Long Islands, but I felt like I was in the Twilight Zone. Full of seafood. My wandering mind was jolted as a strong scent of fried batter permeated the air. Our (now) unsteady gaze (we would later regret the Long Islands) searched and found our waitress, whose wrists were struggling under the weight of our entrees. Even so, she ever so gingerly placed my fish and chips and her platter down. The tour de force had arrived. Magdalena eyed her platter skeptically, not able to discern the quoted three types of shrimp from one another. "It all looks the same," she whined, but within the same breath, grabbed one, dipped it into a curious brown sauce and popped it into her mouth. I hunkered down on my halibut, which was surprisingly thick and lightly battered, a generous portion. The seafood chowder was less spectacular but still flavorful, and the fried jojos were, well, how can you really screw up fried potatoes? Just like life, some things were delicious and some things were mediocre. None of it was outright awful, just maybe a little forgettable. Also like life. The food was gone, our drinks demolished, our bellies sated and without complaint. We looked around the cozy lounge one more time. There was the typical scene you'd expect at a place called Roszak's. The regulars at the bar, one now looking a lot like Ted Danson, were commanding their stools like captains of a moored ship. Each time someone would come in, raining light upon our sunken lounge, they would say hi to everyone they knew in the room—everyone but us. As we packed up our things and got ready to leave, we were reminded how nice it is when everyone knows your name. And sometimes, I'd rather have a great atmosphere than a Michelin star dish.